AzhwAr said in the previous pAsuram that emperumAn showed his simplicity and took him under his wings, after AzhwAr tried to go away from him thinking that he is not qualified to approach emperumAn. After coming out of the “unqualified” tag, his craving for attaining emperumAn increased manifold. He desired that emperumAn should take him to paramapadham and make him a servitor, as he usually does with followers who crave for him. But emperumAn did not do it. This is because emperumAn had struggled to keep AzhwAr with him after he decided to leave and he felt that only after increasing AzhwAr’s craving for him, which is like his hunger to enjoy him, would AzhwAr be able to enjoy him without any indigestion. Hence he kept quiet. Azhwar got scared whether he would remain in this samsAram which is ruled by worldly pursuits such as Sabdham etc (the five sensory perceptions such as sound, touch etc) and suffer. Due to his craving desire to attain emperumAn and his hatred for the worldly pursuits, he cries out such that periya perumAL cannot sleep peacefully and those who hear him would melt. Let us first go through the pAsuram and its meanings. அழைக்கின்றேன் ஆதி மூர்த்தி அரங்கமா நகருளானே. mazhaikkanRu varai mun Endhum maindhanE! madhuravARE! maindhanE – Oh one who has tremendous strength! madhura ARE – Oh one who is like a most enjoyable river! nOkkadhu ozhivadhE – is it correct not to look at me comfortingly? aranga mAnagar uLAnE – Oh, one who dwells inside the huge thiruvarangam (SrIrangam)! anRu – SrIvishNu purANam 5.11.13 says “thathasthath gOkulam sarvam gOgOpIjanasankulam I athIvArththam harir dhrushtvA maithrEyAchinthayath thadhA II” (Oh maithrEya! After seeing how the entire gOkulam, full of cows and gopIkAs (cowherd girls), was sorrowful, [krishNa] started thinking immediately). anRu refers to the day when the calves, cows and cowherds were quivering on seeing the hailstones showered by indhra. AzhwAr says that the danger that he faces today is the same as that faced by calves, cows and cowherds. Just as emperumAn protected them that day from the hailstones, he wants emperumAn to protect him from the shower of sorrow. AzhwAr asks emperumAn “is there any compulsion that one should suffer from hailstone to be protected by you? Will you not protect someone from shower of sorrow? Will you protect only if the entire village suffers? When I am suffering to the same extent as the entire AyppAdi (gOkulam) will you not protect me? varai – When indhra ordered that all the clouds open up, they showered with such an intensity that it looked as if it was the deluge. On seeing this action of indhra because he was denied food by AyppAdi, not having the time to think of sudharSana chakra (the divine weapon, disc), krishNa picked up a mountain that he could lay his hand on. It is clear from this that it is not necessary for emperumAn to use a particular type of weapon to protect a particular type of people. The opinion of AzhwAr here is that emperumAn cannot say that he does not have a suitable weapon to protect him. mun – since he had already used the term “anRu” to denote a specific time, the word “mun” cannot denote ‘earlier time’. Hence, we have to consider the meaning for this word as “before the cows got harmed”. AzhwAr shows here that emperumAn did not wait for harm to come the way of cows and cowherds, as they had no other refuge, but protected them before they were harmed. ALavandhAr, in his sthOthra rathnam 49 says “avivEkaghanAndhadhingmukhE bahudhA santhathadhu:kha varshiNi I bhagavan! bhavadhurthdhinE padha: skalitham mAmavalOkayAchutha!II” (Oh one who is full of auspicious qualities such as gyAna (omniscience), Sakthi (power) etc! Oh one who does not let go of his followers! Show mercy on me who has fallen from the good path due to lack of discriminating ability in this samsAram, which is darkened from all sides by clouds and which is continuously buffeted by different types of sorrows by the darkness of monsoon ). AzhwAr is asking as to why emperumAn is not protecting him when he is calling out to him in pain. 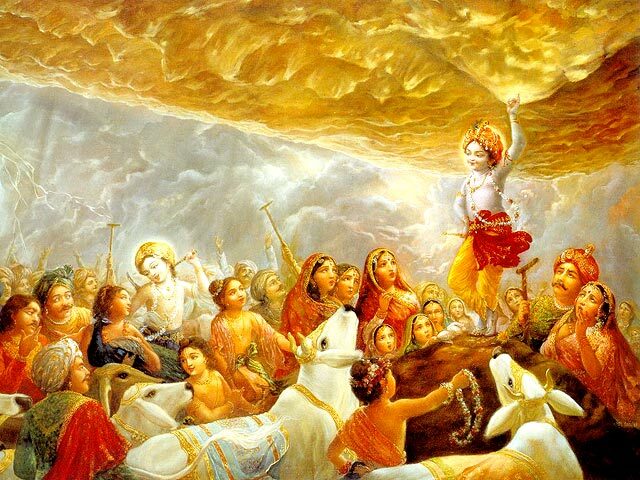 Endhum – AzhwAr shows how krishNa lifted the mountain effortlessly, when he was only 7 years old, as if it were a ball of flowers. AzhwAr is asking whether he is not being protected because emperumAn will feel tired if he were to protect AzhwAr. Just as nithyasUris were holding garlands to adorn him, as said in thiruviruththam 21 “sUttu nanmAlaigaL Endhi”, emperumAn held the mountain for protecting his followers. maindhanE – Oh one who has huge strength to lift a mountain! The word maindhu indicates strength. Alternatively, maindhan also indicates a young person. Thus, we can also consider the meaning as one who becomes young in age since he feels happy on seeing followers who come to him for protection. When a person gets the food that sustains him, he appears younger. The food that sustains a person varies for each person. For emperumAn, who is the protector of all, protecting his followers is the food that sustains him. Hence once he gets a person to be protected, he becomes younger. AzhwAr laments that while protecting him is for the benefit of emperumAn, he has to call out to him for protection. madhura ARE – Oh one who is like a river which has taken the form of sweetness! Even if you are not the protector, as mentioned before, but one who is going to beat up and swallow the follower, your beauty is such that no one will leave you. madhura ARE – why call him as river instead of sea? Since sea water is brackish, it cannot be used for anything. River water, on the other hand, would be useful for taking a bath on a hot day, for washing the face, for drinking when thirsty. Even when it is not hot, it would be useful for removing dirt. Sea will not come to the spot where he is, while river will. Just as a flowing river, during floods, will break dams and come fiercely, this loving river [emperumAn] also gushes in, breaking the dam that AzhwAr had built around himself, feeling “unfit”. Just as the river comes to the place of the person who uses it, this loving river, in its incarnation, comes to his place. AzhwAr thinks of how emperumAn took birth in the dwelling of cowherds, after leaving his paramapadham (SrIvaikuNtam). emperumAn asks AzhwAr “that day, I removed the danger when indhra showered hailstones. Through whom are you facing danger, today?” AzhwAr responds . . . . .
uzhaikkanRE pOla nOkkam udaiyavar valaiyuL pattu uzhaikkinRERku – I am suffering, being trapped in the net of eyes of women, which are like the eyes of a fawn. While these women do not have any affection in their hearts, they will feign as if they consider him as everything and they have no other refuge. I am caught in the trap laid by their eyes, which are like the eyes of a beautiful deer. uzhai refers to a deer and uzhaikkanRu, to a fawn. A net is one which will trap an animal, ensure that the animal cannot escape and, by itself, will be of no use to the animal. The vision-like net of these women also traps a person, making it very rare for someone to escape from it; prevents the person from getting involved with emperumAn who is there as sustaining force and nurturing; and, it is also not having any sweetness within it. ennai – me, who, unlike the cows in gOkulam which were protected, knows that I have fallen in deep sorrow, knows that only you can protect me from this sorrow and who is praying to you to protect me. nOkkAdhu ozhivadhE – when the danger came through stones, you protected with stones [mountain]; when the danger is through the glance [of women], should you not glance at me (protect me)? There is no trouble for you in protecting me, as you do not have to lift a mountain. It is enough if you just glance at me, to comfort my heart. Instead of praying to him to “look at me”, why is he telling emperumAn, with sadness, “why are not looking at me?” This is because, his closeness to emperumAn and emperumAn’s firm affability and simplicity make him say these words with sadness. Even after AzhwAr speaks these words, why is emperumAn keeping quiet? “If I take him under me, he will again try to leave me, thinking that he is unfit to be with me”. Hence, just as a mother waits for her child’s indigestion to be cured fully and the child feels hungry, before feeding it, emperumAn also decides to wait for AzhwAr’s craving to increase further before giving himself to AzhwAr for him to enjoy. Just as a sick child’s wailing to his mother “give me food”, after he is cured, makes the mother pleased, emperumAn also keeps lying down, listening to AzhwAr’s cry. unnaiyanRE azhaikkinREn – am I calling at the door of any lowly person? When I am calling out “please protect me” to you, who is searching for someone to be protected, why is it not falling in your ears? Are you having some other work? You cannot say that you are involved in the work of controlling the world. Even that work appears to be done only for me. emperumAn asks him “what is the compulsion for me to carry out your work at your bidding?” ..
AdhimUrththi – when these chEthana entities were mingled together with achEthana entities without any difference during deluge, without their asking, you only gave them an opportunity and hence it is your responsibility to protect them. chAndhOgya upanishath 6.2.9 says “thadhaikshatha bahu syAm prajAyEyEthi thath thEjO’srujatha” (that brahmam took a vow “l will multiply myself’ for that “I will create myself”. It created radiance). Since you created these, you are responsible for their protection. It is the parents’ responsibility to protect their child. When a child trips and falls, it cries out “ammA” only. aranga mAnagar uLAnE – to make you protect me, do I need to go to the origin of creation, just like one tries to clean an old well? Is it not enough that you left paramapadham and came to SrIrangam for sleeping? Is there any benefit for your being in SrIrangam other than protecting me? Based on each person’s deeds (good or bad) you could have protected from paramapadham itself. There was no need for you to come to SrIrangam. arangamAnagar uLAnE unnaiyanRE azhaikkinREn – I cannot call you at paramapadham. After you came to SrIrangam to create a ruchi (taste for only good things), and after I acquired that taste, should I lose it? Even after hearing this from AzhwAr, why is emperumAn keeping quiet? emperumAn has heard such calls from paramapadham after they have enjoyed him and calling out to him. He has heard samsAris calling out to him for granting them worldly wishes. He knows that AzhwAr’s calling out is not one such. The efforts that emperumAn had taken since time immemorial are now fructifying and this call of AzhwAr is due to that. Since he has not heard this in a long time, he wants to hear this for some more time. Hence he is keeping quiet. Let us next take up the 37th pAsuram. This entry was posted in mudhalAyiram, thirumAlai on November 28, 2016 by T N Krishnan. Wonderful description and explanation! Many thanks!